A sweet addition to the family is coming! 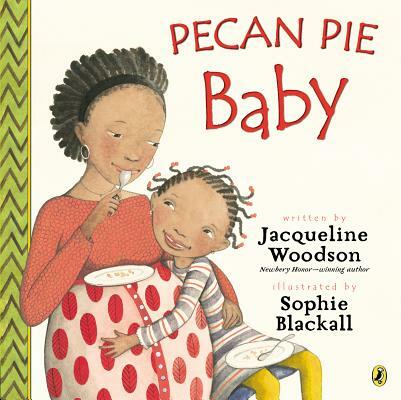 Written by National Book Award-winning author Jacqueline Woodson. Illustrated by Caldecott Award-winning illustrator Sophie Blackall. Sophie Blackall (www.sophieblackall.com) is the illustrator of several award-winning picture books, including Meet Wild Boars by Meg Rosoff, Big Red Lollipop (by Rukhsana Khan), and the Ivy and Bean books by Annie Barrows, and she wrote and illustrated The Baby Tree. Her many honors include a BCCB Blue Ribbon, Ezra Jack Keats New Illustrator Award, Society of Illustrators Founders Award, Publishers Weekly Best Children’s Book, Book Sense 76 Pick, and New York Times Top Ten Picture Book. Her artwork has also appeared in murals as part of the New York City MTA’s “Arts for Transit” program. Previously she has had jobs in a shoe shop and a robot factory. She lives in Brooklyn, New York.